Theater seating is becoming a common fixture in residences all across the country as people strive to create the best at-home movie and television viewing experience possible. The spaciousness and amenities of theater-style chairs and couches appeal to consumers' ideals of comfort and convenience, making these products a consistent top seller in the furniture industry. When it comes to buying theater seating for your home, Palliser is the only name you need to know. Over the years, this manufacturer has forged a well-earned reputation for quality craftsmanship, durable construction, an d superior styling, which is why they are the number one choice among TheaterSeatStore.com's customers. Bullet Power Recline. Available in black or brown leather, this chair automatically reclines with the push of a button. It also comes with built-in cupholders, ambient base lighting, and a removable swivel tray that is perfect for popcorn, snacks, or your iPad or laptop. Blade Power Recline. This is the best-selling Palliser product we carry. The Blade model features a generous 44" back height to ensure comfort for our taller customers, and offers superior support in the head, neck, lumbar, and leg areas. 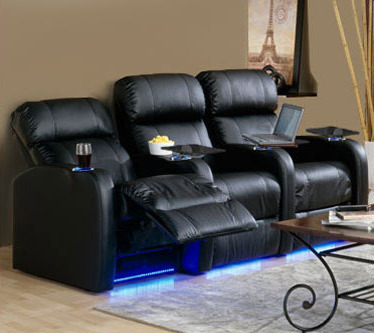 It comes with a deeply padded seat back and seat cushion, an automatic recline button, and has a space saving design. Sequelle. For those with truly discriminating tastes, we recommend the Palliser Sequelle. This is a wall-hugging unit that allows you to fully recline even when the seat back is just a few inches away from the wall. The Sequelle can be purchased in a variety of different colors, patterns, and materials to suit your tastes, and can be further customized with Power Recline or Bass Shakers. Circuit. This brand-new model represents the ultimate in home theater seating comfort, thanks to the ergonomic design and pillow top seat cushion. LED cupholders, LED base lighting, and armrest storage are all standard. Moreover, you can choose from straight or curved configurations, as well as loveseat or sofa-style designs to get the look you want for your home. Any of the above Palliser products can help transform your dull living room into an entertainment enthusiast's dream. Be sure to visit TheaterSeatStore.com today to view our entire collection of theater seating options and choose the recliner, chair, couch, or loveseat that best fits your décor.